Maple & balsamic make Brussels sprouts irresistibly sweet & tangy in this hearty side, and caramelized roasted onions add delicious depth of flavor. Let the Thanksgiving countdown begin! This year we’re starting with the vegetable that everyone used to hate that everyone now loves – Brussels sprouts! This recipe is a spin on one of our first-ever blog posts. In that recipe, I roasted the sprouts with a combo of balsamic vinegar and maple syrup. As a result, they become nicely sweet and caramelized and have a great tang from the balsamic vinegar. Looking back, the photos are pretty bad. I would have deleted the post by now if it weren’t for the continuous emails I still get about it. So, I made these roasted Brussels sprouts! The basic concept of this recipe is the same – I roast Brussels sprouts on high heat with maple and balsamic, but this time, I added a few extra components. Oven-roasted onions – This easy addition goes a long way. Slicing a red onion, roasting with your Brussels sprouts, and tossing it in the final dish adds a punch of sweet, caramelized flavor to this side. 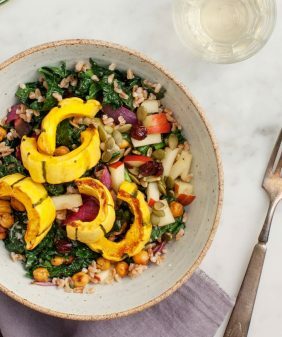 Farro – Farro makes this side a little heartier, but even more, it adds yummy nuttiness and chewy texture. Cranberries – They’re festive for fall! Also, they add sweetness, chewiness, and a pop of color here. Pecans – You couldn’t have great a roasted Brussels sprouts dish without a little crunch, so I tossed in a handful of toasted pecans. In addition, their flavor is wonderful with the maple/balsamic/cranberry combination. Lemon juice + Dijon – It wouldn’t be one of my recipes without a squeeze of lemon, right? These ingredients are essential for adding a bright finish to this dish! 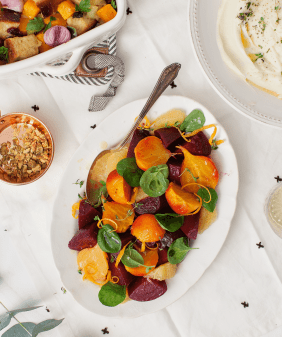 I really love the balance of flavors and textures here – it’s perfect as a holiday side dish, but it’s also a great weeknight dinner. Bonus – if you end up with leftover farro and Brussels sprouts, you’re already halfway to having Farro Fried Rice the next night! This delicious side is a Thanksgiving favorite, but with the farro, pecans, and cranberries, it's hearty enough to be a meal on its own. Preheat the oven to 425°F and line a large baking sheet with parchment paper. Bring a medium pot of water to a boil. Rinse the farro and add it to the boiling water. Reduce the heat and simmer, covered, for 25 to 30 minutes, or until tender but still chewy. Drain and spread on a plate to cool and dry. 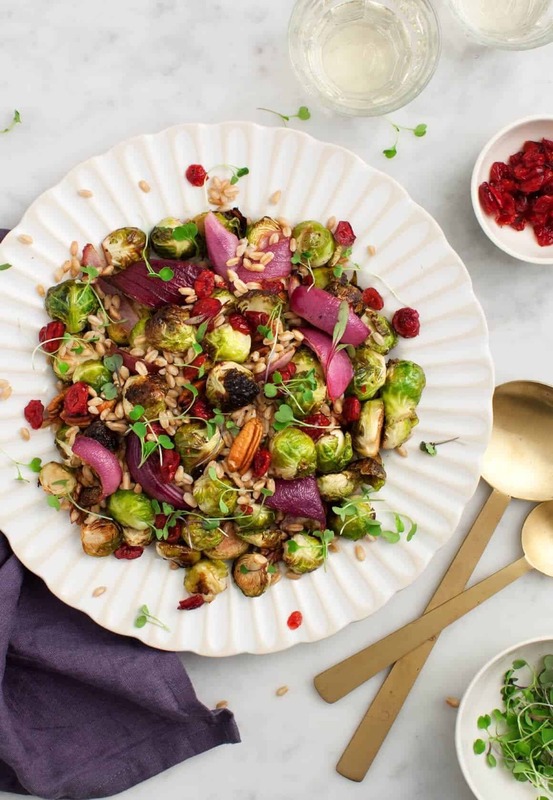 Spread the Brussels sprouts and red onion wedges onto the baking sheet and drizzle with olive oil, the balsamic vinegar, maple syrup, and generous pinches of salt and pepper. Toss to coat and roast until tender and browned around the edges, 30 to 40 minutes. Meanwhile, in a large bowl, combine 2 teaspoons of olive oil, the lemon juice, Dijon mustard, and pinches of salt and pepper. Add the farro and toss. Add the Brussels sprouts, along with the pecans and cranberries. Toss and season to taste with more salt, pepper and lemon juice. Finally, serve with microgreens for garnish, if using, and enjoy. Note: this salad is good hot or at room temperature. For a gluten-free version: skip the farro or use quinoa instead. Actually this looks like a very healthy lunch, in addition to a yummy T-day sidedish. bahaha its so true – it was the most hated vegetable forEVER, and now everyone can’t get enough of it. this looks amazing, the cranberries and pecans would be such a great addition. Brussel sprouts are amazing and this combo looks divine. We are making it for the upcoming holiday and perhaps will have a trial run this week. Maybe pomegranate seeds as a garnish ? Thanks for your lovely inspirations. This looks gorgeous! I’m printing out the recipe right now and will try. Thank you! 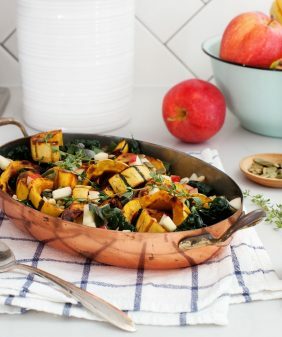 This recipe looks beautiful and sounds delicious! Can’t wait to try it out. Oh hi! this is exactly what my body is craving. I love brussel sprouts! They are my new addiction! This recipe looks wonderful! Thank you for sharing! Made these brussel sprouts today! So good! And such a nice change from the regular roasted ones! So gorgeous! Healthy and beautiful – what more could you want? 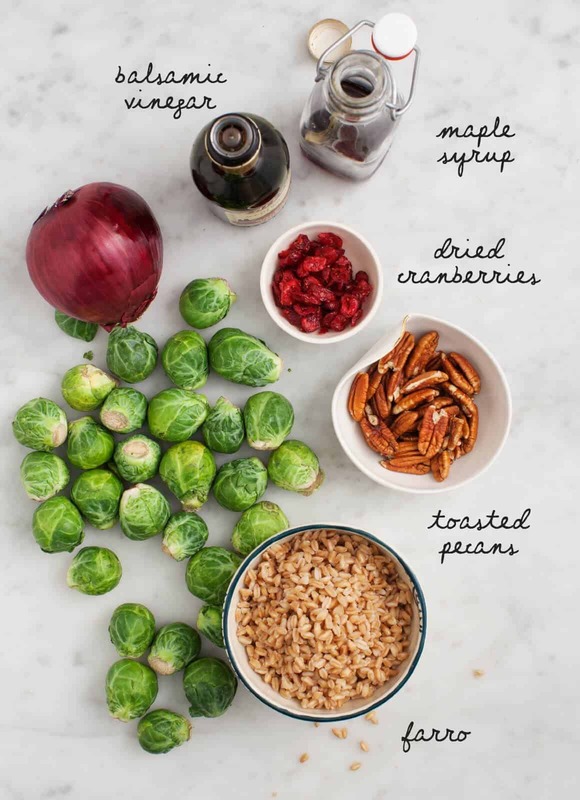 Love the idea of maple and cranberries with all the rest, yes brussels have certainly become beloved, but I’ve only seen them paired with bacon and parm, not as part of a more healthy salad! Thank you! While this might not be my favorite vegetable, our family enjoys it. This is a perfect way to prepare it for Thanksgiving dinner. I made this for a Friendsgiving potluck, and it was delicious! I subbed cranberries for pomegranate seeds and pecans for hazelnuts, but otherwise followed it to the letter. The leftovers made a great next-day-brunch when I added some fried eggs. Thanks for sharing! Made this for Thanksgiving, so delicious!!! Delish! I made it to go along with turkey and butternut soup and cranberry/apple sauce! Thanks for another excellent recipe! This looks so good! 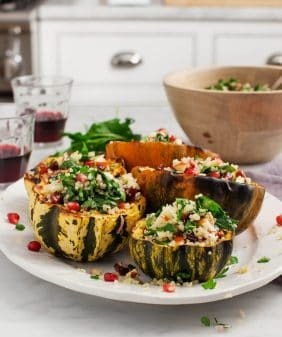 I would love to make this as an easy weekday lunch… does this keep in the fridge for a couple of days? Either way, I can’t wait to make it! Hi Casey – it should keep for a couple of days, let me know if you give it a go! This is officially one of my go-to recipes. I am a vegetarian and my boyfriend is an avid meat eater and even he loves it! Great for family potlucks and and a great make-ahead meal. I make my version of this similarly, but I add my super thick, syrupy sweet balsamic vinegar near the very end of roasting. I use walnut halves and dried fig halves for nut and fruit (figs go in late, just to warm up) , which is a killer combo. Brussels sprouts are a regular veggie for us. At Thanksgiving my wife cooks them in Guinness Stout. I like you variation..nice twist ( different for us) with the balsamic vinegar and maple syrup. There are many things to do with maple balsamic roasted brussels sprouts. This looks perfect for Thanksgiving, but because I need to prepare other dishes, I’d like to make this the a couple hours before dinner is served. What would you recommend for re-heating? Would you leave out on the counter for a couple hours before re-heating, or popping in the fridge? Thanks! Hi Felicia, for 2 hours, I’d pop it in the fridge and reheat it when you’re ready. I think it’s safer than leaving it out on the countertop. After you re-heat, add a little squeeze of lemon, and salt and pepper to taste. Hope that helps! 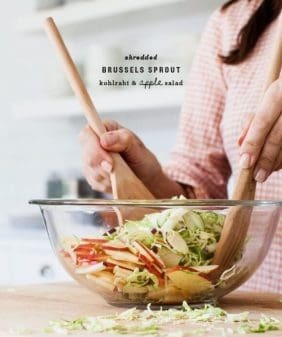 I made a shredded Brussels sprouts salad similar to this & it called for pomegranate arils. They loved the flavour but did not like the crunchy seeds in the arils. The next time, I will make that an individual add-on. Farro is not Gluten Free!! It refers to several different types of wheat i.e. : spelt and a few other ancient wheats. 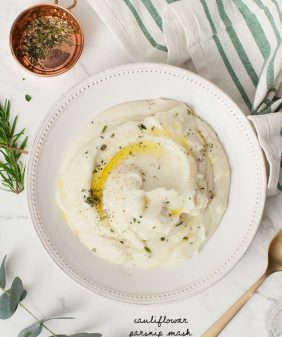 This recipe sounds and looks beautiful however, if someone were to make it for a guest with Celiac with good intentions (using this recipe found in your GF recipe index), the guest would get sick. The recipe is labeled with a gluten free modification to use quinoa instead. This was a very satisfying dinner on its own. Threw in some broccoli and asparagus and it was delicious. Leftovers are going with my daughter for lunch tomorrow. This will definitely be in our rotation. Thanks!